This is far from the first time drivers have piled into bus stops ( see e.g. 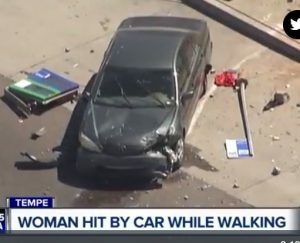 bus-stop-killed in Ahwatukee, or leg-amputated in Tempe, or car-slams-into-bus-stop-teen-bystander-killed in Phoenix ). Happens all the time, out of control drivers are here, there and everywhere. In other recent auto-carnage news, Wrong-way driver involved in February crash had .238 BAC. A wrong-way driver was impaired? Imagine that. He was seriously injured. And just a few days before Peoria police announced they arrested a driver who killed… “Justin Stasierowski, 37, was driving a car that strayed from the road and struck (killed) a 65-year-old man who was walking on a sidewalk…”. They think he might have been drunk when he drove up on the sidewalk. Footnote Penny L. Brown’s death: this may or may not be included as a traffic statistic; the “unstablized situation” apparently began in a private parking lot. it seems as though some are and some are not with no clear pattern. The only way to know for sure is to wait and see if it appears in 2018 FARS.